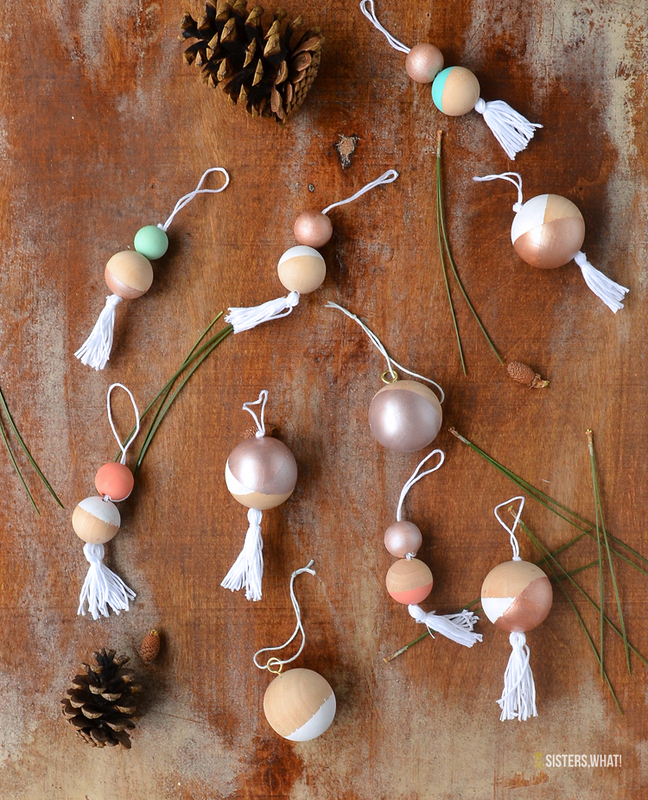 ' Color Blocked Wood Beads Christmas Ornaments - Sisters, What! 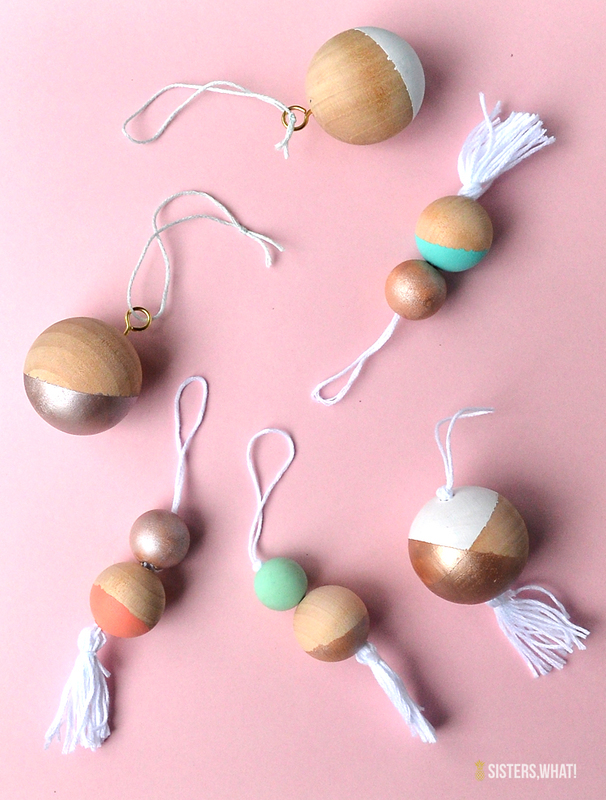 These color blocked wood bead ornaments are simple and easy to make. They can be customized to match the colors of your other Christmas ornaments and would make a great present topper. 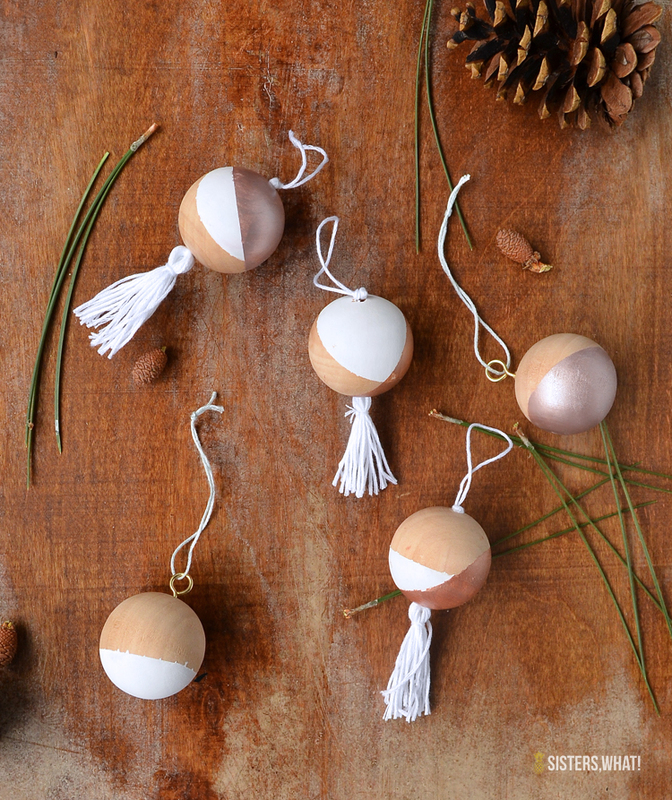 I recently have fell in love with the simplicity and nature like Scandinavian Christmas decoration. 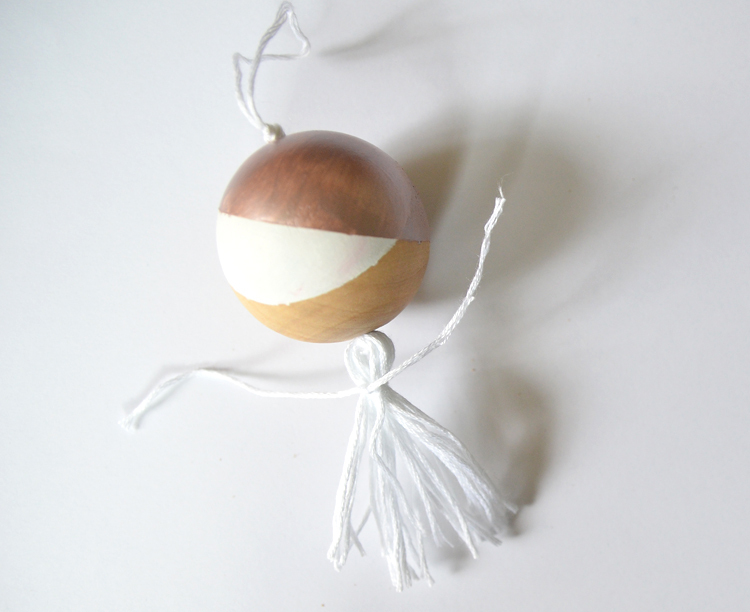 I love the natural wood look and the shapes they often use. 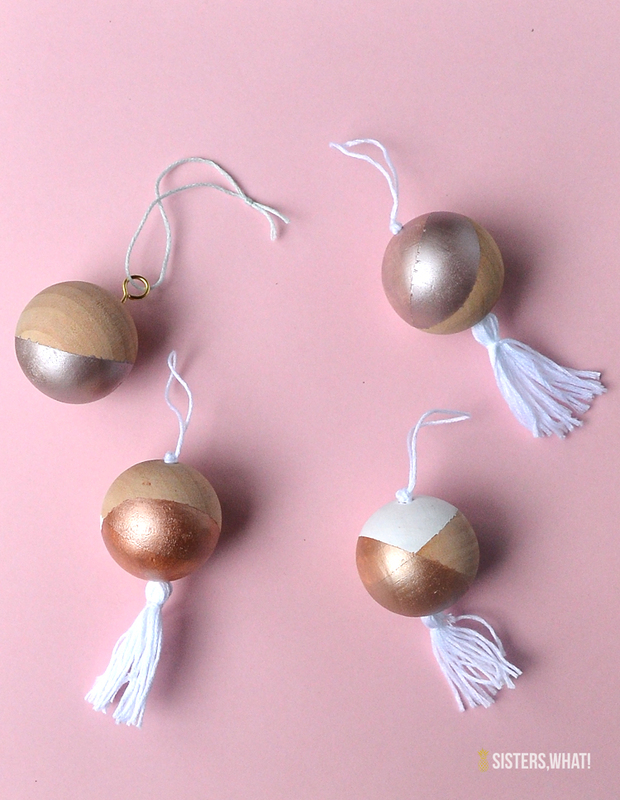 Now these ornaments are definitely a little more modern, but I was definitely inspired by Scandinavian traditional ornaments. 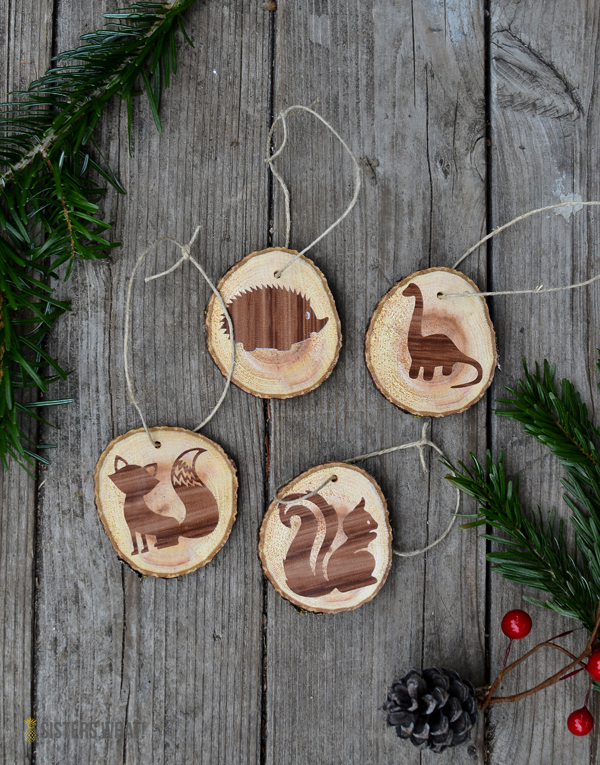 So I actually made these ornaments last year and realized I never actually got around to sharing them on here. They are very simple to make and would look good in various colors and could even be perfect as a present topper. If you got large wooden balls without holes you need to drill into them to hold the screw eyes. 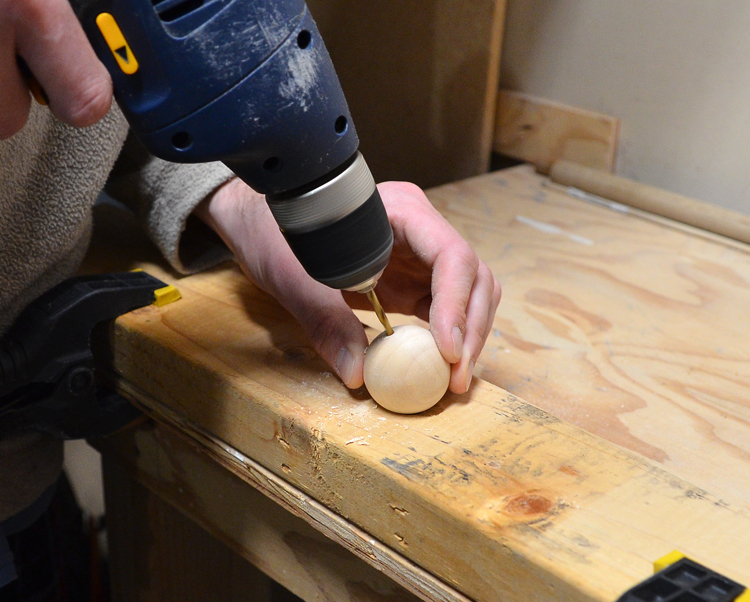 When I drilled it, I held it tightly and Just eye balled the center. 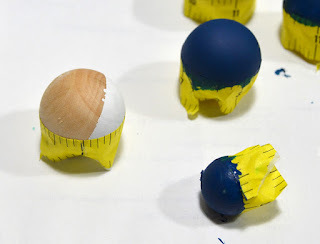 Next, using scotch tape or painters tape, tape off a section of the bead. I didn’t want it perfectly centered, so I taped it a little off center. Press tightly to seal the tape on. 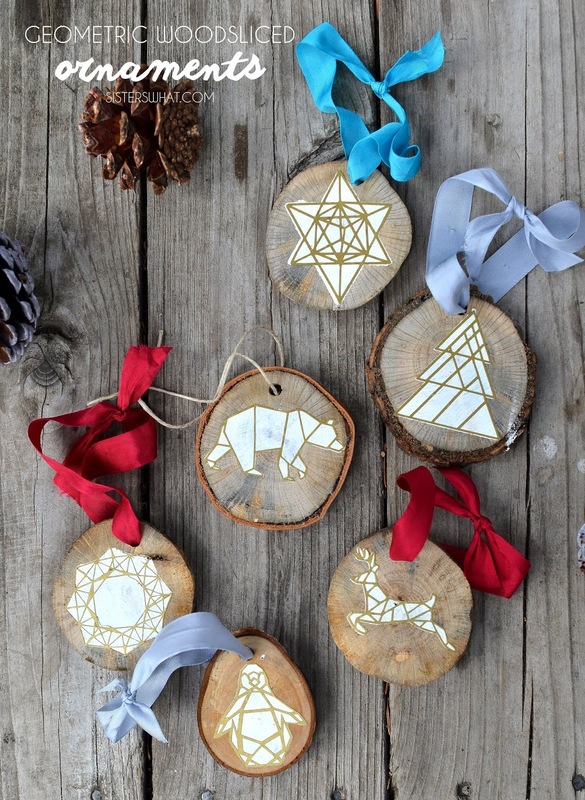 Now tape your first color on. 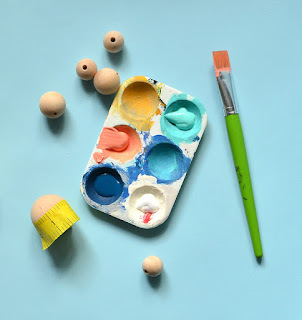 I initially painted the white color on first but after I was done with all of them, I realized that painting metallic first would be better. 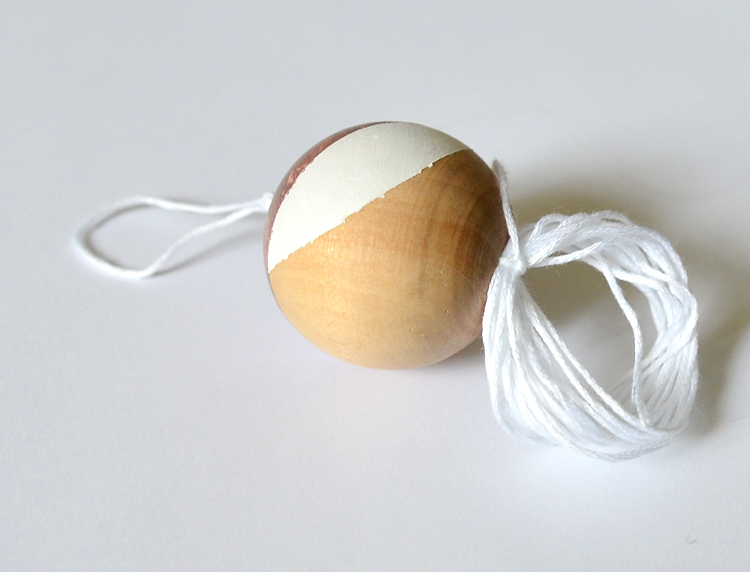 Now after your first color has dried, place a new piece of tape onto the wood ball to create a new line. 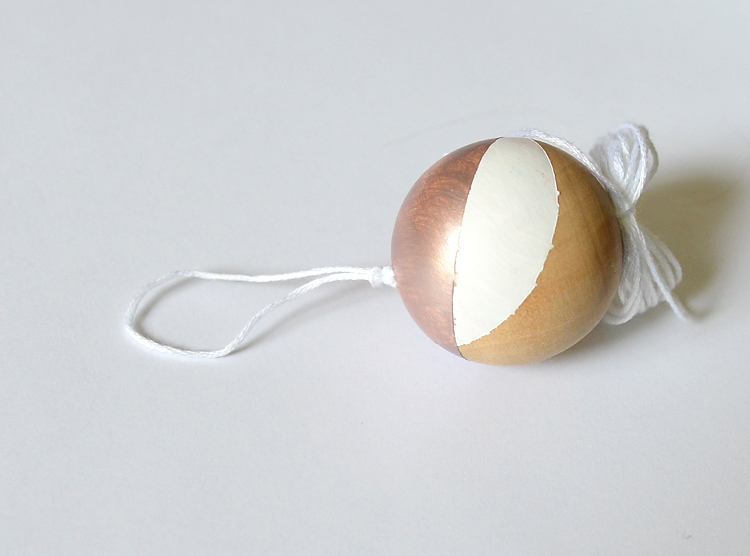 But leave some of the first color under the tape so that some of it will still be seen. Then, with the floss. We’re first going to start making a tassle by twisting the floss (your choice of color) around three fingers about 8 to 10 times. 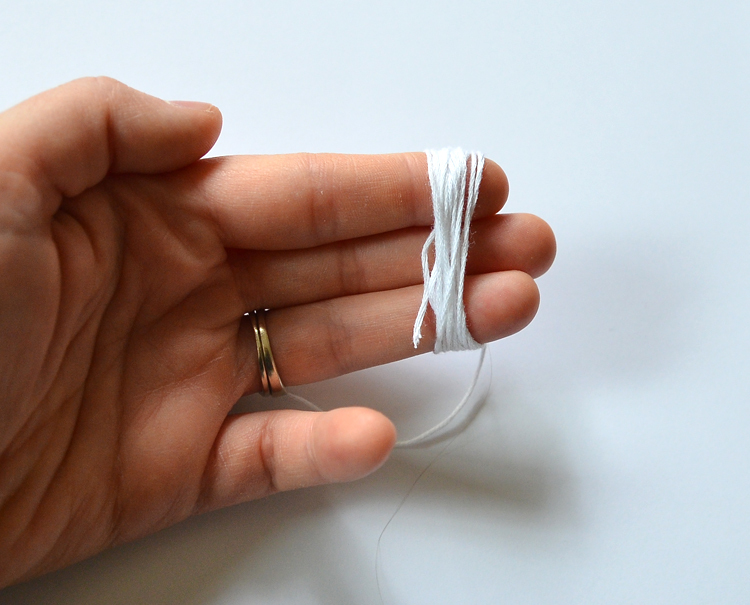 Now leave it in a loop and just cut the string off from the rest of the floss, but don’t cut the loop just yet. 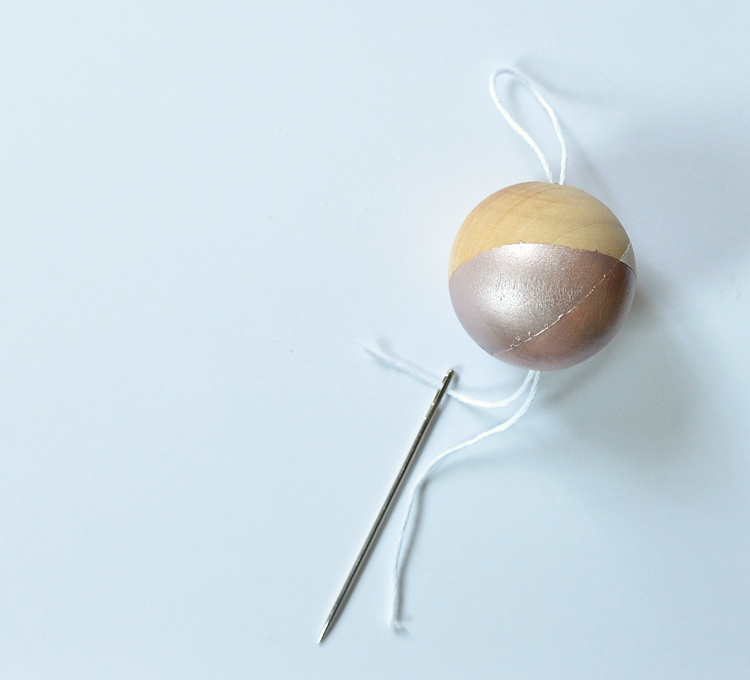 Next, take another long piece of floss and string it onto a big needle if needed and bring it through the center of the wood bead. Then take it back through but leave a large loop on one end. 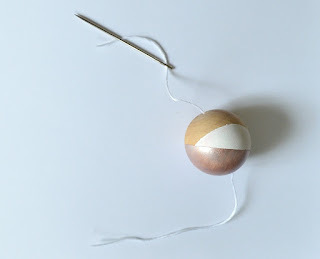 Now tie off that large loop two or three times to make sure it is secure and not going to go through the wood bead hole. Then at the bottom of the tassle loops, cut the loops. 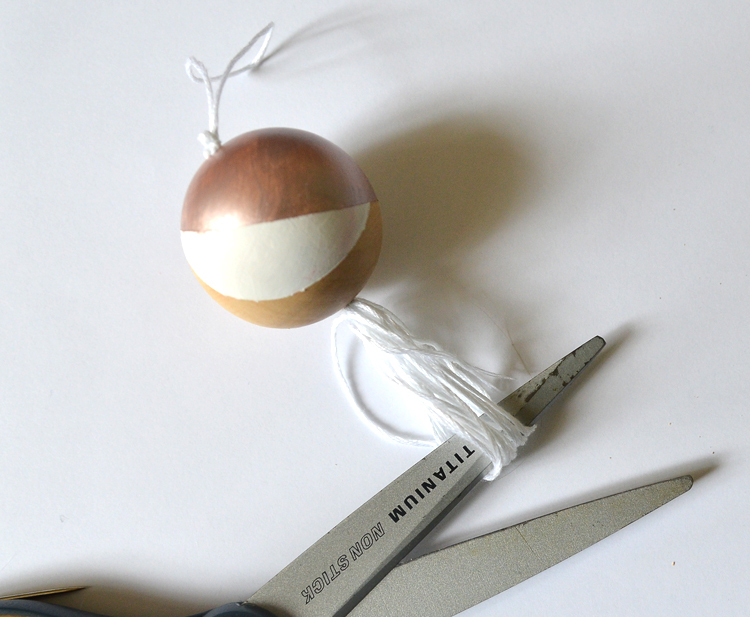 Grab another little embroidery floss and tie a little knot around the top of the strings to make it a tassle. 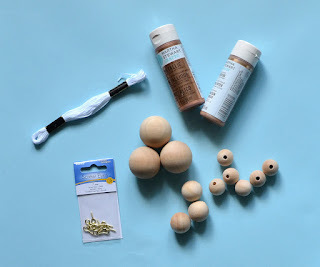 Now for a quicker variation, take your screw eyes and press really them really hard into the wood ball and start turning them until they are all the way in. 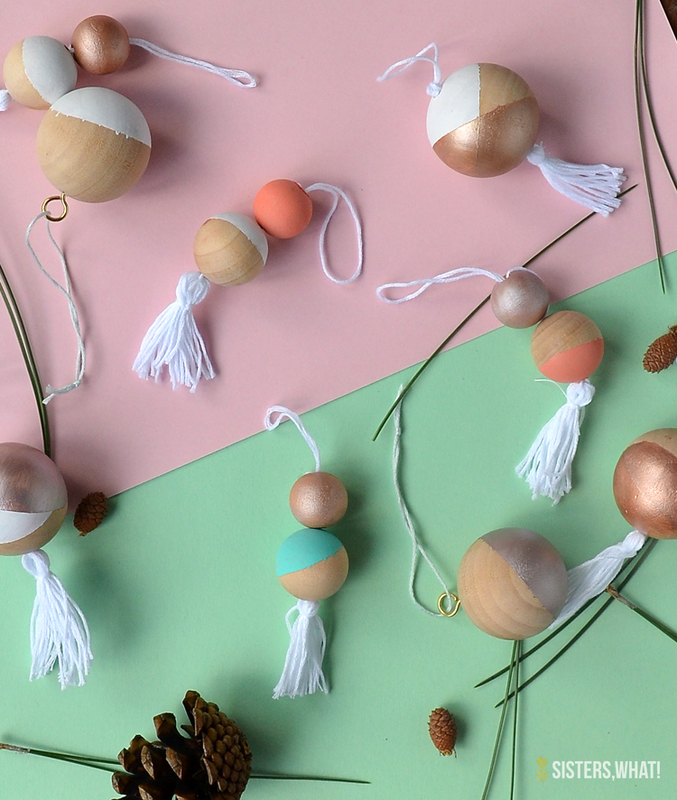 And they tie on a string. 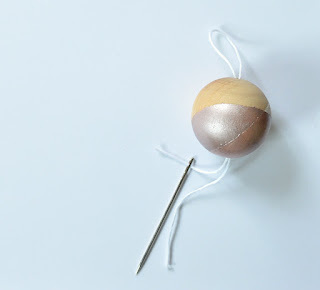 To do a double layer beaded ornament, just do the same thing, but add a smaller bead on top of the bigger bead.